A new 89-page report by the Uyghur Human Rights Project (UHRP) documents the Chinese state’s top-down destruction of Uyghur communities in Kashgar and throughout East Turkestan, in a targeted and highly politicized push that Chinese officials have accelerated in the wake of turbulent unrest in the region in 2009. Living on the Margins: The Chinese State’s Demolition of Uyghur Communities reveals how the destruction of Uyghur neighborhoods has resulted in the loss of both physical structures, including Uyghur homes, shops and religious sites, and patterns of traditional Uyghur life that cannot be replicated in the new, heavily-monitored Chinese-style apartment blocks where many have been forcibly relocated. This report does not discount the importance of providing modern structural amenities to Uyghurs. However, it asserts a failure on the part of Chinese authorities to engage in meaningful consultation with Uyghurs regarding how they wish to transform their own communities. The report details the international and domestic legal instruments to which the Chinese government is bound that are designed to protect residents from forcible eviction from their homes and ensure that indigenous populations, such as the Uyghurs, have the right to develop according to their own principles. The campaigns underway to tear down Uyghur neighborhoods in East Turkestan and replace them with spaces resonant of eastern China, which Chinese leaders have labeled as development, have been implemented by Chinese officials alongside assimilative programs that remove Uyghurs’ rights to speak and use their own language, practice their own religious beliefs, and express themselves through art, literature and the media. State repression of these aspects of Uyghurs’ unique culture epitomize Chinese officials’ attempts to weaken Uyghurs’ connections with their traditional customs. Chinese leaders’ success at assimilating Uyghurs into a Han Chinese physical and social structure has come from a lack of consultation with Uyghurs themselves as to how they would like development to proceed. Without the consent of Uyghurs to demolition and resettlement projects, the legitimacy of stated aims to create “peace and prosperity” through the projects is called into question. Uyghurs view Kashgar, a center of Silk Road activity memorialized in Marco Polo’s travels, as the spiritual heart of their culture, a cradle of Uyghur civilization that is fundamental to their Uyghur identity. 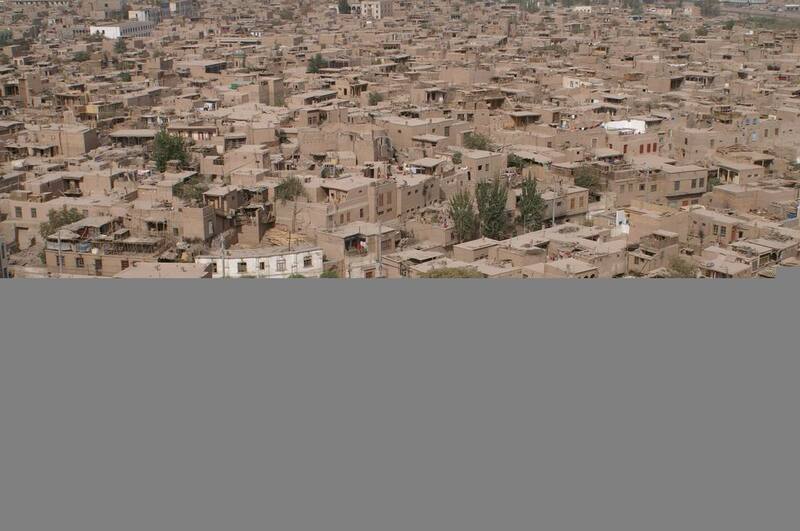 Once seen as one of the best-preserved traditional Islamic cities in the world, Kashgar’s Old City is undergoing a transformation that represents an irreplaceable loss of heritage to Uyghurs and to the international community. Without any role in the decision-making process, many Uyghurs view the transformation of Kashgar and its re-creation as a Chinese city as the latest official step in removing Uyghurs’ identity and integrating the region into China. Uyghurs perceive the demolitions as changing the landscape of East Turkestan from what has been a Uyghur-dominated style for thousands of years into a “modern” Chinese style indistinguishable from the rest of China. In their rush to modernization, Chinese leaders have shown similar disregard to the structures embodying Chinese heritage throughout the People’s Republic of China, and to the discontent expressed by Chinese residents regarding their destruction. However, the official disregard of the value of Kashgar and other historically Uyghur areas is accompanied by ethnic and political dimensions unique to the demolitions taking place there. This report builds a case that “development” projects in East Turkestan’s Uyghur neighborhoods entail the physical destruction of Uyghur cities and towns; and equal the comprehensive assimilation of Uyghur people into the fabric of broader Chinese society and culture. The report asserts that the scope and centrally-directed nature of the projects across the region illustrates the highly politicized character of this assimilative process. Send observers to East Turkestan with unfettered access to Uyghur communities to impartially oversee that all international and domestic legal protections have been utilized in demolition projects across the region. UHRP hopes the report and its recommendations will serve as an informative and useful resource to concerned governments and institutions.